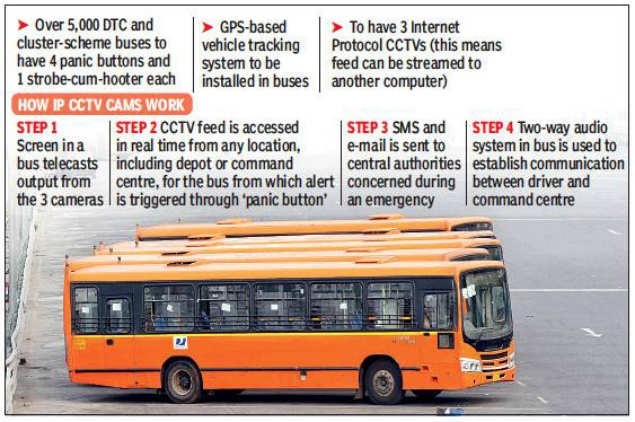 The process of installation of CCTV cameras, Panic Button and GPS in Delhi Transport Corporation and cluster-scheme buses is expected to begin soon and likely to completed by November. NEW DELHI: The process of installation of CCTV cameras, Panic Button and GPS in Delhi Transport Corporation and cluster-scheme buses is expected to begin soon and likely to completed by November. A tender for CCTV cameras and panic buttons was floated in November last year, but it found hardly any takers. As a result, the clauses were changed allowing more bidders to participate and the tender was floated again. “In the last tender, only two firms had responded. However, one of them had applied after the last date and was technically disqualified. That left only one bidder, so the tender had to be floated again after rationalisation,” a transport department official said. Sources said that some parameters, such as annual turnover and overall experience, in the tender were tweaked to allow more firms to participate. “We have now received four bids. At present, the bidders are showcasing their prototypes in buses. We expect the process of awarding the tender to be completed very soon, following which installation of CCTV cameras, panic buttons and GPS-based vehicle tracking system will start,” said the official. “Initially, we had planned three panic buttons in each bus, but we thought there should be more buttons for easy accessibility. We are trying to provide one panic button on every third seat in a bus,” the official added. Though the tender is likely to be awarded soon, the installation process could take up to seven months. “The work can only be undertaken for about six hours at night when the buses are in the depots. The project will require dismantling of the bus roof for wiring and other devices to be installed,” he said. At present, only a few buses at Sarojini Nagar and Raj Ghat depots are equipped with analogue CCTV cameras as part of a pilot project. The primary aim of providing this technology in the buses is safety of passengers, particularly women. As the CCTV feed will be monitored in real-time from control centres, the response time of transport and other authorities in the event of an emergency would be quick and effective, officials said. The installation of CCTV cameras in public transport buses has been a key poll promise of Aam Aadmi Party. In his first budget speech as finance minister for the financial year 2015-16, deputy CM Manish Sisodia had proposed installation of CCTV cameras in all DTC and cluster buses.